I'm thrilled to look back on this year and realize that it's been a busy year for family dinner. The topic of family dinner has been in the news more than ever. It has been profiled as a way to promote healthy and enjoyable eating at the table, which may in turn help prevent childhood obesity and eating disorders. Family dinner has been touted as one solution to social disconnection among teens and tweens and a way to reduce bullying, alcohol and drug use in this group. Perhaps most importantly, the ongoing topic of family dinner has been a reminder that it is a great way to re-connect with the people in our lives on a regular and meaningful basis. I'm grateful to have been a small part of this family dinner movement! The Family Dinner Book by Laurie David was published late last year. It really inspired a nation-wide conversation about the benefits of family meals. The weekly Family Dinner Table Talk on The Huffington Post has helped provide great conversations for family dinners through the year. EatDinner.org (my organization) launched a Family Dinner Survey in the Spring of 2011 and has had over 500 respondents. The more we learn about what really works for busy families, the better we can promote and encourage the commitment to family dinner. Some preliminary results are here. 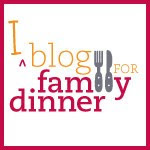 Blog for Family Dinner was created as a collaboration of Billy Mawhiney, Time at the Table, Kathleen Cuneo, Dinner Together and myself. In the month of September 26 to October 24, 2011, we had over 30 writers contribute stories and advice about family dinner. It has been great to connect with a community of bloggers from all different backgrounds who all agree on the importance of family dinner. CASA's Annual Family Day received wide attention, and was profiled on ABC news. CASA updated their annual study about the effect of family dinner to prevent substance abuse among teens. The new study added detailed questions on frequency of family dinner, the quality of family relationships and likelihood of teens using alcohol and illegal drugs. Food Day, founded by CSPI, was a nationwide event October 24, 2011 that encouraged us to "Eat Real America!" Blog for Family Dinner was proud to be part of its NYC Times Square event. Andy Bellatti of Small Bites put together an exhaustive (and a bit depressing) Year-end Round-up of Food Policy News. Worth a look.